Our award-winning all natural sipping chocolates are to the lover of fine chocolate what espresso is to the lover of fine coffee. We consider this the ultimate liquid chocolate experience. Immerse your taste buds into this rich, dark, bittersweet chocolate drink crafted in the incomparable European style. The lingering creamy mouth feel with its subtle hint of vanilla finish will immediately transport you to a sidewalk bistro in Venice or Barcelona. 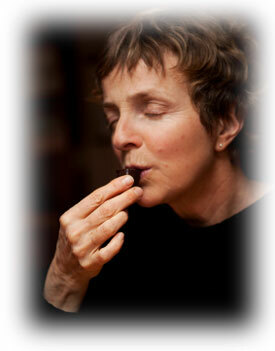 For centuries, Europeans have been sipping and savoring chocolate slowly and with pleasure. Now, discover the pure decadence of Sweet Divas' fine sipping chocolate and see why it is called "the espresso of chocolate." True chocoholics may also choose to have this custom mixed with espresso and served in a chocolate-lined edible sipping cup. Perfect for enjoying at one of our outdoor tables overlooking the St. Petersburg Pier and Tampa Bay.